GameAnotherDay: thatgamecompany's 3 game deal with Sony; The Fantasia of Video Games? 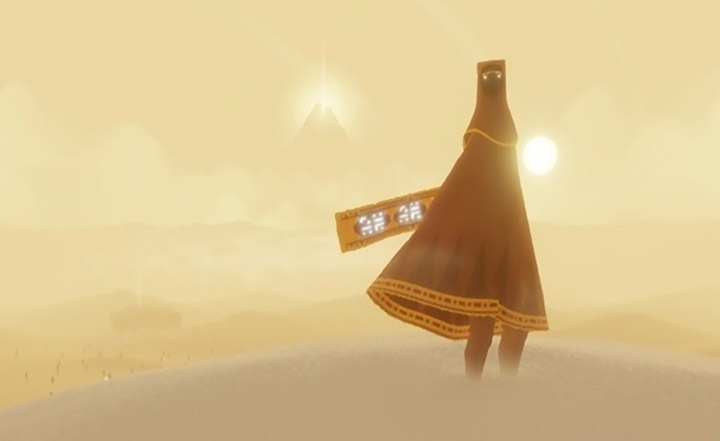 thatgamecompany's 3 game deal with Sony; The Fantasia of Video Games? So, I finally have a weekend to myself. Nothing to do but catch up on some quality video game time, watch the Tigers, and make some progress on my wargaming miniatures. First up? Journey. I've been waiting for some time to myself where I could give the game a complete play through without interruption. I'd heard that the game takes 4 hours to complete (actually less, I think I may have been under 2 hours) so this was a great opportunity to do so. thatgamecompany, the studio behind Journey, is a critical darling well known for putting out "games" that fall comfortably into an "interactive art" genre. Their 3 game deal with sony consists of "flOw", "flOwer", and "Journey." The latter two garnering substantial accolades from critics. Gamers and critics often set their hopes on when at some point, a video game will come along that will make you cry. The idea being; that invoking such an emotion would finally elevate video games to the respected levels of movies, television, and books. Journey doesn't make you cry. At least it didn't me. There was no reason to. However, something else incredible happend. I don't think I've ever played a game where I experienced a rush of chills. At least not until I completed Journey. I've played all three of thatgamecompany's PS3 games, and it's worth pointing out that all three games have an underlying theme of growth. This growth is also mirrored in the companies ambitions with their games. It's through that connection that I'd consider them together as a 3 movement symphony, made more so by their attention to music's influence in the game experience. Where fl0w had you gliding through a microbal haze, toying with Darwinism, flOwer placed you in control of a flower pedal's destiny as it danced across breezy pains. Now Journey. Visually, they've raised the bar for themselves as a company and, as noted above, have broken new ground in story telling, albeit in a minimalistic way. If you play games for something other than a competitive gratification, if you're interested in games and observing how they continue to evolve within the industry and the market it serves, if you find yourself taking the time in your games to slowly look around the environment to see what remarkable work the developers put into the game, i'd suggest playing Journey, and would love to hear your impressions as well. Below are video clips from all three of thatgamecompany's games.